This has been a busy week, but I had a slow and easy book to read when days got too chaotic and long. 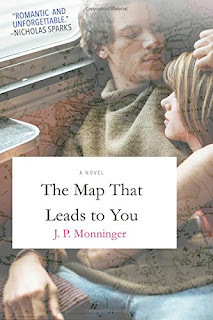 The Map That Leads to You by J.P. Monninger was released this week, and it is a great escape read. It is heavy on the romance and big on the tears. So, basically, if you like Nicholas Sparks, this is a book that you will love. The novel follows a group of three girlfriends who go on a European adventure upon graduating from college. But, the novel primarily focuses on Heather. Heather is an organized, controlled, structured, ambitious woman on this big adventure before she enters her grown-up real-world finance job. She is taking the trip with her best friends, and I enjoyed reading about their relationship. But, this book isn’t about their friendship. This book is about falling hard and fast for a man named Jack she meets on the train to Amsterdam. This book is a dialogue book. In other words, most of the novel is told through conversations between characters – primarily through the dialogue between Heather and Jack. It is sweet and romantic, but it is also steamy and frustrating. Jack is the opposite of Heather. He is spontaneous and struggles with the concept of being stuck in one place at one job. So, there are multiple bumps in their European love journey. If you like books about travel, love, adventure, and some sap, then this is the book for you. It was just what I needed this week, and I bet you will agree.